I thought it would be a good time to do and entire family update! So we will start with the littlest treasure. Hannah has been growing like a weed and we have enjoyed watching her find her voice in groups of adults and show off some of her famous humor! She is loving dancing to her new videos and reading short readers on her own. We are experiencing some interesting reactions to the loss of all the older siblings and me being gone for 2 weeks. Praying she will soon feel some stability again. And as we are finding out our man of the arts---drawing, dancing, drumming, drama---notice all the "d" words. Caleb is enjoying his 3rd year of football as a defensive back. He is looking forward to trying school in a different way this year--by video. This picture of Drew was taken while he was counselor at the Steens Mountain Camp. He loved it. We totally enjoyed having him home this summer, though we saw little of him between work, sleeping, friends and running. Drew came home with Mono---hence the many hours of sleeping trying to give his body a chance to heal. Think he may have finally kicked it after 4 months. He is back at school and in his own appartment. Pray for him and the many other students you may know away at school. Pray they may stay strong in their faith, that they may shine brightly for their Lord. We were sad to say good-bye to Erinn back in July as she and I drove 3 days to get her and all her stuff there! But we are thrilled to announce the homecoming of our son, Michael, home from his tour of duty! They are beyond excited to begin thier new life together. A few months in Texas then on to their posting in Hawaii. Pray for them and their adjustments in the coming months. 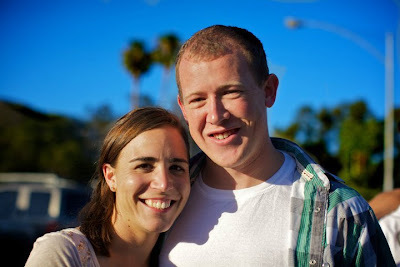 Danielle and Ryan are doing better than ever in Santa Barbara. Ryan is loving his new job and the opportunities he has there. Danielle continues at the Reagan Ranch, learning and growing. They serve together in youth ministry at their church and are very involved there. They were recently blessed with a trip to Washington DC for a friend's wedding and ran a 1/2 marathon for their 1 year anniversary. They may be looking at their own deployment in the coming year. Pray for them to continue to grow and trust in the Lord. This wonderful man the Lord blessed me with---I wonder sometimes how I was so blessed. David did a great job watching the kids while I was away. He shuffled and juggled when situations at work left him unable to take time off. Work has really kept him on his toes lately and we are praying for some smooth waters. Also his arthritis is in a major flare right now and he is moving in a lot of pain. But moving he needs to do to keep his body from locking up. Hence you see the problem. The lack of major exercise also causes him to be somewhat down, so we are praying for some insight into what can be done to help. Because he is on a first generation drug, they do not know what the long term affects will be, kinda feels like a guinea pig. He will be having a full body bone scan soon to determine how bad this flare is and what if anything might be done. All when school what done and we thought life would calm down for him! Me----well I am learning thankfulness in a whole new light. I am learning to trust in the providence and sovereignty of God at a whole new level. I am learning to be a willing piece of clay molded into the likeness of our Saviour. Trusting that He knows what is best and being thankful for even the ugly because it is all from His loving hand. This has been a journey that many days I would have liked to miss, but knowing the end destination is worth the climb. So there is the quick update on the clan. Though we may be spread far and wide, we are still family, and where there is family there will be love and prayer and support. GREAT to hear how you all are doing!